Hamilton places second in Junior Achievement Challenge - Hamilton School District. 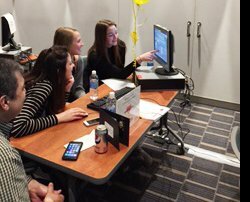 Two student teams from Hamilton High School Business Department competed Feb. 23 in the Junior Achievement (JA) Business Challenge sponsored by Kohl’s Cares and held at Briggs & Stratton. 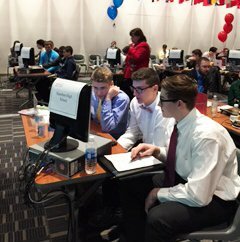 Sophomores Augustus Bronson, James Richter and Aaron Thompson won second place in their industry competition in the Milwaukee Metro division. In addition to qualifying for future scholarship opportunities, students received tickets to an Admirals hockey game. The second team of seniors Calli Seston, Grayce Shaw and Natalie Pena qualified for scholarship opportunities. “Networking with business professionals in the area and making real-life decisions are impossible to do within classroom walls. I’m thrilled the students did so well and made some great connections for their futures,“ said Toni Hillmann, business education teacher. The JA Business Challenge is a business strategy tournament for young entrepreneurs. Students are teamed with a local business professional and participate in a hands-on computer simulated business making day-to-day decisions. The purpose of JA is to inspire and prepare young people to succeed in a global economy.